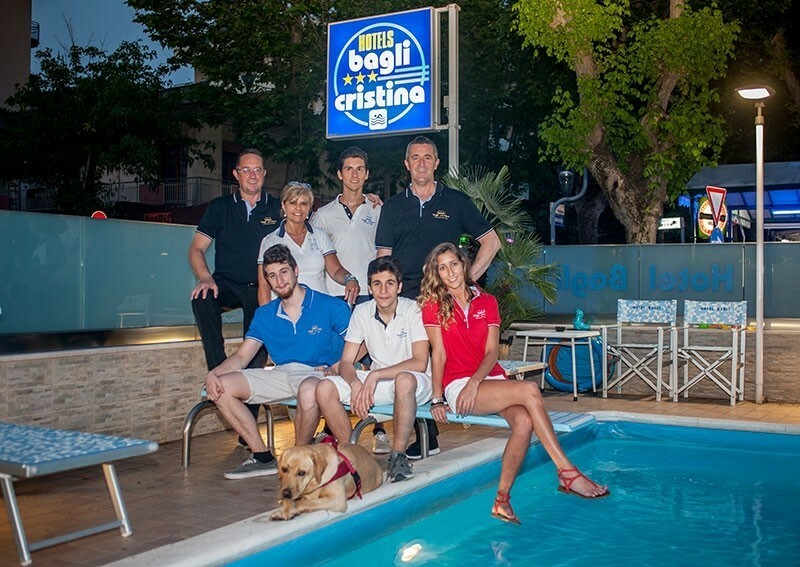 The Hotel Bagli and Cristina is situated in Rimini in a quiet area of Rivazzurra, close to the sea and a few kilometres from the centre of historic Rimini, easily reached by public transport or by car. The location of the facilities is strategic to reach the city of Rimini or Riccione and the most important attractions, among which the most famous amusement parks, night clubs, and the Fiabilandia amusement park, a few steps away from our facilities. The station is a few kilometers and with the service of bus of line 10 and 11 you can arrive at the bus stop n°26, near the hotels and take Via Lecce. Fromthe airport Federico Fellini of Rimini, a distance of about 2.5 km there are several taxi services that in just a few minutes will take you directly to our hotels. Drive up to the Hotels Bagli and Cristina is very simple. From the A14 highway exit at Rimini Sud. Once out of the utostrada turn right in the direction of Rimini Fiera/Verucchio, continue on the SS72 from Rimini-San Marino. Continue straight onto via Circonvallazione Nuova SS16. You will find a series of roundabouts. at the first roundabout take the third exit and take via Antonio Rosmini Maintained. At the second roundabout take the second exit onto via Giuseppe Melucci. At the next roundabout take the first exit and take viale Siracusa, turn right into Viale Regina Margherita. Continue up to the right Via Lecce, via degli Hotels Bagli and Cristina.